Well happy birthday to you Naomi Osaka. All day yesterday, the tennis player received lots of love as she celebrated her birthday and turned the big 21. One fan in particular couldn't help but acknowledge Naomi's big day with a hilarious post. "Happy birthday, @Naomi_Osaka_," Ellen DeGeneres shared on Twitter with a shirtless picture of Michael B. Jordan from his movie Creed. "I got you a present. @michaelb4jordan." Soon after the post was shared, Naomi jokingly replied "pls block me." Don't block anyone girl because you never know who will show up in your feed. "This one is better and more recent. LOL," Michael later shared on Twitter with a shirtless selfie in the gym. "Happy Belated Bday Naomi. But seriously I want to invite you to the Creed 2 premiere as a bday present." 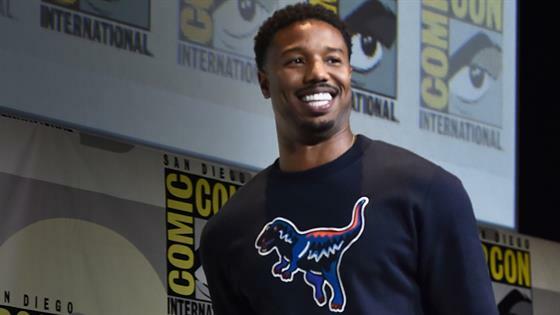 Michael B. Jordan Bulks Up for "Black Panther"
Just last month, Naomi appeared on The Ellen DeGeneres Show where she revealed her celebrity crush was Michael. As a result, the talk-show host offered to play matchmaker for the tennis superstar. "Do you want me to text him right now?" Ellen offered. "I'm going to get my phone, I'm going to text Michael and I'm going to tell him that he should meet you." Naomi replied, "You're stressing me out. I'm too young to be stressed out like this." Ultimately, Ellen followed through with her text message and Michael definitely responded. "I just want to say congratulations…I wanted to send my love and support and just say congratulations. It's a big moment for you and the way you carry yourself with such humility and grace, it's really amazing to see," he shared. "You're setting a great example for the kids and little boys and girls that are looking up to you so continue to work hard." We don't want to say it's love but let the sparks fly.